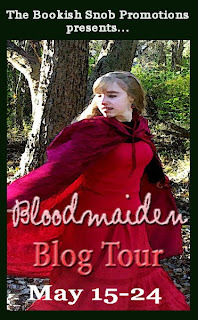 ReaderGirls is today's stop for the Bloodmaiden Book Tour today. We welcome author Christine E. Schulze. Bloodmaiden's summary: Zale. Gauthier. Varden. These three dynasties... They all sound like something out of an ancient, oriental myth or fairy tale. The concept of humans and dragons helping and living in harmony with one another, without fear. To me, that's exactly what they are. A distant dream only read of, whispered secretly, quietly yearned for. For, you see, I am the new Quelda of Tynan. These words echo the mystery, horror, and romance found within Schulze's fantasy novel. Along with her new husband, Chalom, Crislin must choose to embrace cruel tradition, run from it, or stand against it. The young couple's only hope is to rally the help of the three peaceful dragon dynasties of Sulaimon-but tradition is not on their side, even outside the realm of Tynan. The dragons outside Tynan's borders have been rumored as too stubborn and proud to believe their Tynanian brothers would commit such horrors as inflicted upon the Quelda. Gaining their aid is not a likely hope. Yet, any hope at all is valued in Tynan... If they are to stand a chance of bringing cruel tradition to a permanent end, Crisilin and Chalom must brave the constant, consuming blizzards of the Ever-white. They must brave the three dynasties and the challenges awaiting there. Together, they must convince the dragon emperors to allow them access to the shrines which house the sacred Aria - protective strands of music which may be able to disperse the evil from Tynan and unite the four dynasties of Sulaimon as a whole once again. Their only aid stems from a sprite whose moods are as unstable as her magic, a young minstrel, and a mysterious fox. Despite the odds, such plans are daring, dangerous, unprecedented, but fully possible - if they can escape the Wall first. Hello, readers. My name is Christine E. Schulze, and I thank you for stopping by to check me out, check out Bloodmaiden, or maybe even to enter a giveaway or follow the whole tour. I’m honored to be here, whatever your reasons for being here too. To start off in this first guest post, I’d just like to first of all give a big thanks to everyone involved in the tour—I’m definitely excited to be here!—and tell a little bit about myself. I’ve always had a passion for writing. I’ve been writing since I was around four; my debut novel came when I was a flower girl in a wedding. The bride, a friend of the family, asked me to write her a story for a wedding gift. Using the adventures of some of my favorite toys, Jonny to the Rescue was forged; it would much later serve as the backdrop needed to create my currently self-published series, The Legends of Surprisers. From here began a wild adventure from which many seeds would sprout, seeds to plant all sorts of stories from the gardens of Fantasy/Adventure, Christian/Fantasy, Sci-fi/Fantasy, and later, with some of my fantasy books, bits of Horror and definitely Romance as well. I’m often asked what I like to read. I like to read a lot—the only thing is that I don’t actually read a lot. Often too busy writing, creating, or promoting my works in one way or other. But I do love and draw inspiration from authors such as Diana Wynne Jones, C.S. Lewis, Neil Gaiman, and others. I’ve been told Bloodmaiden compares to The Hunger Games, which I’m interested in reading. I just finished The Forest of Hands and Teeth and yearn to devour its sequel; it reminded me a bit of Bloodmaiden mixed with the film 28 Weeks Later. 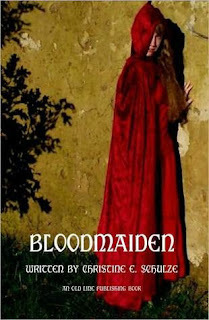 I’ve also had readers compare excerpts of Bloodmaiden to Tolkien’s and Rowling’s works, a humbling praise for a new author as myself. Besides writing and reading, I have a wide range of other interests. So wide, that I find it wise to focus on my main passion of writing. If I tried to focus on everything I’d like to, nothing would ever get done. One must have wisdom to discover which things are most important to work on. So, I call myself a “dabbler”. Here and there, I like drawing, photography, graphic design, singing, playing piano, and composing music. I’ve helped create some promotional artwork and music for Bloodmaiden which will be displayed in a later blog post. Beyond that, I enjoy working at a daycare with my “onesies”, as I’ve lovingly dubbed them, and also plan to pursue some substitute teaching for elementary students and possibly even modeling on the side. Well, there’s a bit about me and my interests. Again, nice to meet all of you, and feel free to ask me any questions you might have right here. God bless, and enjoy the rest of the tour! About the author: Christine E. Schulze has been creating books since she was too young to even write them in words. Her collection of YA fantasy books, The Amielian Legacy, is comprised of series and stand-alone books which can all be read separately but which weave together to create an amazing fantasy. Her fanatsies also incorporate many other genres, such as Christian fantasy, romance, and even a spark of horror at times. She hopes to inspire readers throughout the world with these books by publishing in both traditional and electronic formats to make them available to all readers. 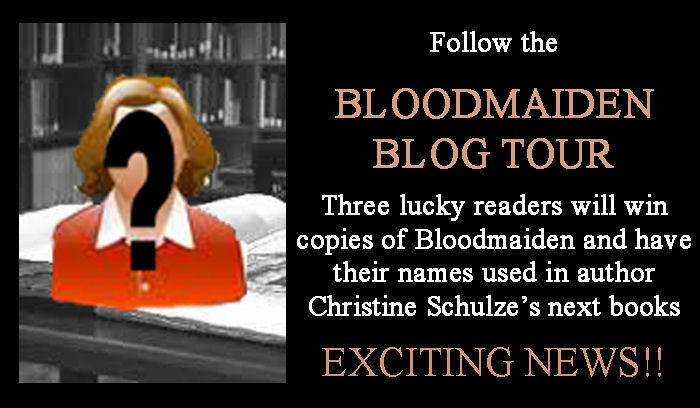 Three very lucky readers will win a copy of Bloodmaiden and have their names appear in Ms. Schulze's upcoming book! Enter today. We thank Christine E. Schulze and The Bookish Snob Promotions. I love it when authors share insight into themselves.. it helps make the story more personable :) Thanks for sharing a great post Christine! the book sounds interesting going on TBR pile can't wait toread it. Book has very interesting story and the cover is amazing. I think its awesome that you started writing when you were 4. I love the Bloodmaiden cover its so pretty. Thanks for all the compliments and encouragement! Thanks also to my lovely host; I've enjoyed touring here!